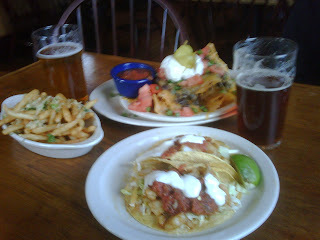 Graduation weekend means lots of eating (never a bad thing) and I got to start my weekend off right with happy hour at Laurelwood NW Public House with Nick and his mom.We decided to go all out with $3 beers, the pork sliders ($4), fish tacos ($4), nachos ($4), garlic fries ($4) and beer-battered onion rings ($7.95, not on the happy hour menu but worth it). 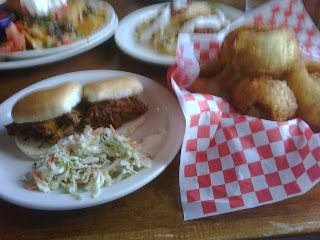 While the food was not exactly innovative, it was delicious, especially those onion rings. And while it was still on the chilly side when we visited, I can see why the patio is always packed during the summer months. As if all that food wasn't already enough...a little bakery called Two Tarts caught my eye through the window while we were eating, so a quick stop there was obviously necessary. At first I was a bit worried when I saw how small the pastry display case was, but the idea behind Two Tarts is that it's not about size, it's about quality. Or, if you're me, it's about trying several different small pastries instead of just one. While the offerings vary from day to day, when we stopped by they had mini lemon bars, hazelnut baci, chocolate chip fleur de sels, roobars, passionfruit creams, rosewater almond macaroons and a few others. The lemon bars were excellent as were the chocolate chip fleur de sels. I definitely plan on taking my mom here when she visits since she has an even bigger sweet tooth than I do!